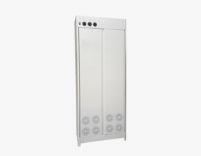 Dry laundry cabinet Eolo artificially reproduces the functional characteristics of the drying rack by drying the laundry with a simple jet of warm air that does not dry the fabrics. Designed for home use and for small accommodation, sports, etc., it allows drying up to 15 linear meters, using linen racks to be positioned according to needs. Eolo guarantees maximum efficiency even at low temperatures, protecting the laundry from atmospheric events and fine dust. Eolo is able to contain 7-10 kg of laundry.